I purchased this book a couple of years back, I really couldn’t remember exactly when. All I know is that, I learned a lot from it. It practically changed my mindset about online marketing and and added more value and a better perspective towards entrepreneurship, self-reliance and putting up extra effort towards reaching your goal as a virtual professional. The book is a personal manual so to speak especially designed for online career (virtual professional) but equally useful for all other fields of endeavor wherein you can go back to if you want to improved on things not only in your career but even in your personal life or well-being. I highly recommend this to any one particularly to my fellow OFWs who wants to go home for good and be with their families 24/7. More power sir JH – blessings! Reading this book was all worth it. It opened my eyes into the reality of this virtual career, that it is indeed true. The content of the book contains all the practical and actionable how to’s to get you started in this virtual life. One thing more it gives you the mindset of how it is to work outside of the corporate world. The book is the foundation of your virtual career. It will help you gain proper mind-set and the basics. Most questions lingering to a mind of a starter will be answered here. Have a blessed journey! It’s time to switch your mindset. You will discover a secret formula that unlocks the steps to your virtual career, unique solutions to fix most online job problems and more. Get a chance to peep on the stories of ordinary Filipinos who work from home. The book also has wonderful freedom scenes that you will experience if you follow the instructions in the book. It is one of the few books in the country that talks about virtual careers. Foundation is the important part of building the house. So as your virtual career, your foundation is very important. Reading the virtual career serves as your tough foundation in your virtual career journey. Make your foundation tough. Grab a copy of JH Virtual Careers Book now! Alright, bakit nga ba kelangan mo basahin ang Virtual Careers Book? You see, reading the book itself is like visiting my favorite grandma… why? And the stories of Virtual Professionals in the book are a plus factor, since, once upon a time they were not expert yet and along the way they made a mistake or face challenges… In the book, they told us what to do and what not to do for us to avoid the same situation and how to prepare and be successful in this career… Cool ha? What else can you say? They’ve been there, done that How can you refuse to get the takeaways once you read the book, right? This book is so great! As I read, it allows me to have a deep and accurate understanding on how I can manage life, business, and family even if I am just at home. It’s a basic manual for aspiring virtual employees/ professuonals. A must-to-read book if you are serious about starting your virtual career, and serious about leaving your stressful commute life to spending more time with your loved ones. A big “Thank You” to the author, Jomar Hilario for writing book! I am entering a new chapter in my life. Before beginning, I usually equip myself with the necessary tools. One of these is the Virtual Careers Book by my mentor Jomar Hilario. It caters a complete package for newbies like me. The book teaches about the right attitude, confidence and skills you need as a VP. To get all three, do everything in this book. Learn about the 4 Ds and how to really P.R.E.P.A.R.E. Add also the inspirational quotes, stories and pains of other VPs that can jolt you to act and be serious with virtual careers. I love how organized the book is to fit my learning needs. It’s truly the ultimate tool to start as a virtual professional. The intellectual virtual careers book is a guide to start you from working online. In this book, I learned the right mindset the apps and tools, tips, technique and practices educate you to prepared for a virtual career. It has a vigorous information and worth to recommend to help you start a virtual career. Everything you need to know on how to start you virtual career step by step. It is Great to have this book>>VIRTUAL Careers-bysirJomarH.<<, every thing you need to start with is written in this book. even the smallest topic/ thing is essential. It was like 'No boring chapters ', from foreword up to the last leaf of it's page. If you are thinking to start of Virtual career -this is the first step to do- Grab this book! We are very fortunate that this book is selling for a minimal amount but the return is definitely BIG! All you need to do is to apply and follow how it works. For me, Virtual works means -, doing more important things, spending time with my family, taking care with kids and more. yet less spending time in work. AND also being LAZy (or FRee). VIRTUAL careers expand your Virtual skills, it's unlimited and needed to nourish. So, again Grab the Book and take some lessons with sir jomar as a mentor. Have a GReat JOURney …Virtually! #VIRTUAL #VITUAL #VIRTUAL CAReERS….. This is your must-read book when you wanted to start a Virtual Career in the Philippines. As I wanted to have more time with my family while earning. This book helps me to shift the hectic call center job to a comfortable but exciting virtual career, this also opens a new gate of opportunity especially coping with the technology and modern life. As I wanted to have more time with my family while earning. This book helps me to shift the hectic call center job to a comfortable but exciting virtual career, this also opens a new gate of opportunity especially coping with the technology and modern life. 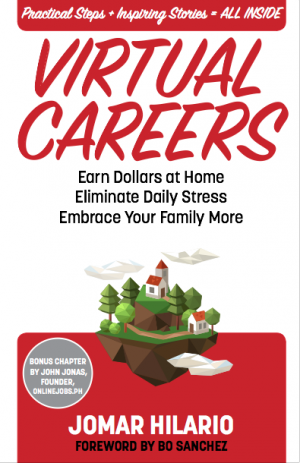 I just finished reading the Virtual Careers book by JH which I bought last April 27, 2018. A very inexpensive book that gives a clear and very skillful insight into the world of highly paid Virtual Professionals.It clearly pinpoints the direction we must take to start a successful VC job.The proven formula and time-tested tasks made sure that anyone who reads and applies the tips given will always be on the right track to become an EXPERT VP right from the very start. Its inspiring, knowing that others as presented in the book have successfully achieved their dreams of earning more at less stress. Kudos to you Sir Jomar Hilario! This book will guide you on how to work online as a virtual professional. Virtual careers book is a Must to read and apply. Its gives me the picture and lots of information about the careers in the World inside the Web that is really Wide. Aja to the turned Virtual Professional and the soon to be! The Marvelous Jomar Hilario!!! I’ve been working as an Online Teacher for more than 6 years and thought that I had the best job ever until I read this book. It gave me another perspective of what virtual working is and the bigger potential and possibility for growth. I am still in the process of implementing what I have learned and so far I am already getting interview appointments from potential clients just after 2 months of focusing on this course. There’s no turning back. I have accepted the challenge and am excited for the new information I learn everyday. This has truly opened a door of opportunity for me and for many as well. I am happy to have purchased the book Virtual Careers by Jomar Hilario the virtual professional guru. I want to shift to another work stream in the next few months so I am now on the hunt for options to pursue. Jomar’s book gave me the idea that I can earn while staying at home – a sharp contrast to the present job that requires me to be in the workplace as early as 7:30 in the morning on some days. Yet, I am luckier than many workers because it takes just an hour or so for me to get there. Even then, Jomar’s idea that I can choose the work that I will do, the clients that I can have and the income that I can earn is novel; it’s so inspiring! I am not a techie but I can learn. With the techniques that Jomar generously shares in such a very detailed manner, I look forward to doing what I have always enjoyed or should I say loved…writing (even if writing does not love me so my family and friends tease me). His book will pave the way for me to go into something I love while giving me my desired income without the hassle of commute, the frustrations from office politics and the fixed work hours. I look forward to getting the job that I love so, as Confucius has said “I will never have to work a day in my life!” I know getting into virtual career will not be easy – the reason why I need 100 deep whys….to keep me going when the road is uphill and things do not turn the way I want them to. Jomar shows the way to beat the odds. Life is full of challenges we accept that….but we can prepare and arm ourselves with the right weapons so we emerge victorious. I consider Jomar’s Virtual Careers book as my first weapon to serve me in good stead as I tread the bumpy road to becoming a highly paid virtual professional. 1. its cheap, I got mine at P300 (e-book). Very affordable for someone who needs to be constantly on the lookout for ways to stretch the peso. 2. some may not like the many exercises that the student must do, but that’s the only way to learn, by doing!